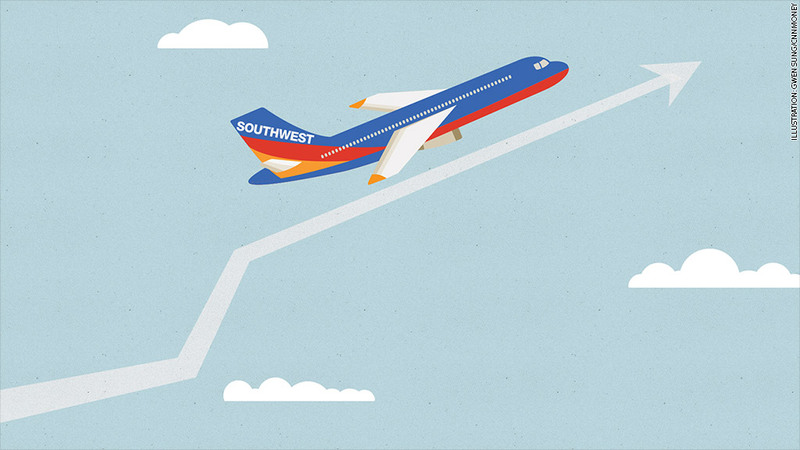 Even for the high-flying airline sector, Southwest (LUV)is in a class of its own. The stock has soared 110% this year, making it the best performer in the S&P 500. The reason is simple: an improving economy and industry consolidation have led to packed planes and record profits for all airlines. American (AAL), Delta, (DAL) and United (UAL)are all cruising comfortably with gains between 50% and 80%. But Southwest has climbed above them all. And it's managed to do so without loading up on passenger fees. "Bags Fly Free" is a mantra for Southwest. Customer satisfaction: Even with the headaches of modern day air travel, Southwest seems to be getting something right. The airline ranked second only to JetBlue (JBLU) in an airline customer satisfaction survey earlier this year from the American Customer Satisfaction Index. "The flying public seems to like the product," said Dan Veru of Palisade Capital Management. "There's a culture there that's very customer centric. Some of the airlines you feel like they're at war with the customer." In addition to its "Bags Fly Free" policy, Southwest doesn't charge fees for changing your flight, according to its website. Such practices "engender goodwill with passengers," claimed Veru. In the case of other airlines, "what's left to charge for?," he said. Sticking to its routes: Southwest keeps things relatively simple in terms of where it flies. Other than select destinations in Mexico and the Caribbean, it doesn't go international. Even more, it's capitalized by concentrating flights out of smaller airports that serve major cities. It's main hub is Love Field Airport in Dallas, which although not nearly as large as Dallas Fort Worth, is actually closer to downtown Dallas, which many customers feel is more convenient. It similarly flies out of Midway airport in Chicago and MacArthur Airport on Long Island. Then there's its fleet. Southwest flies mostly Boeing 737s, which keeps costs low since pilots don't need to spend time away from flying training on various aircraft. The company also knows exactly what parts it needs to keep in inventory to keep the plane flying, Veru noted. "They know everything about that plane," he said. Running with the big boys: While Southwest often gets lumped in with low cost carriers, it's actually right up there in size with the main legacy carriers. It merged with AirTran in 2011, and over the years has been steadily expanding. At almost $27 billion, it's market value is bigger than that of United. The company has also traditionally kept a lot of cash on hand and it's the only major U.S. airline that hasn't flown in and out of bankruptcy. "The way that they run the airline...they're not controversial," said Veru. After its epic journey, it's unclear how much more room the stock has to run. Though 60% of analysts rate it "buy," according to FactSet, that's well below the percentage of experts that recommend its rivals. For example, 94% of analysts recommend buying Delta (DAL).